This is a process that is popular on smaller numbers of garments, and is best suited to t-shirts, poloshirts, running vests, sports clothing, hoodies, soft shell jackets etc. We can print solid colour designs to a number of different positions on a garment – ideally suited to stag and hen shirts where indiviual names and numbers are required. We can also supply a number of special effect; foils, reflectives, flourescents, Glo-in-the-dark, glitter and metallic finishes. Again, this process is ideal for smaller numbers that require multi coloured logos, full colour photographs for stag and hen shirts or special birthdays. This process is ideally suited to T-shirts, poloshirts, hoodies and sports clothing. 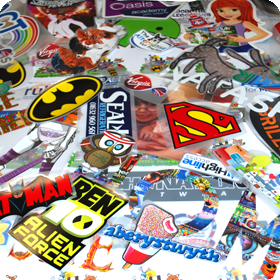 We also print in house full colour banners, banner stands and stickers, any size, for any event, promotion or display. For queries or quotations, contact us now.